I read somewhere that the interest to millions of Indian TV viewers is such that a four Test tour of Australia by India is now worth more money to Cricket Australia than an Ashes tour. That interest is inspired by some quality cricket and the odd controversy. Both teams play hard and neither gives an inch, so a ‘Michelle’ or a ton are hard earned and deservedly celebrated. To explain how these matches came to be so fiercely contested, Kersi Meher-Homji, traces the history of clashes between these two foes of Test cricket. From Bradman to Kohli, and all the greats in between, the cream of both countries’ players and their past deeds are brought back to inspiring life. It is surprising, given how fiercely they compete now, just how reverently the Indian players appeared towards Bradman and the other Australians on their first tour Down Under in 1947-48. The author tells us that this tour, apart from Bradman scoring his 100th hundred, is best remembered for a new term being added to the lexicon of cricket. Vinoo Mankad, a quality all rounder, ran out a dozing Bill Brown at the non striker’s end on two occasions and ever since this form of dismissal has been known as a Mankad. In his defence the bowler had previously warned Brown of his intention to run him out if he didn’t stop backing up too far. Apart from Australia having some early success, and one great series win at the turn of the century, it seems that home ground advantage has proven most decisive in which team wins the series (the book was published before India’s great series win this summer). Despite the predictability of the winner there have been some great matches and big controversies. Meher-Homji, does not shy away from any of the controversies and deals with them in an even handed way. From Gavaskar attempting to take his partner from the field, when he was not impressed with an umpiring decision, to ‘Monkeygate’, all are fairly covered. The great cricket matches deservedly take centre stage, with Kapil Dev’s heroic 5-28 on the last day to win a Test and help India to share a series for the first time in Australia, one of the best covered in the book. This was also the match where Gavaskar attempted his walk off. Meher-Homji, describes the ‘Miracle in oh Kolkata’, when Indian came back to win a Test after following on. For an Aussie fan it brought back all the dismay of listening to VVS dispatching the Aussie bowlers to all parts. As an Australian you kept thinking “this can’t last much longer” but it did, and for a lot longer too. The author is well placed to write this account, born in Indian but moving to Australia in 1970, when in his early 30s, he appears to be that rare breed; an unbiased supporter. It might be his impartiality that has contributed to such a well researched and immensely readable account of these matches. Highly recommended. What timing! After 71 years and on their 12th tour Down Under, the Indian cricket team finally broke their ‘duck’ by beating Australia 2-1 under the inspiring captaincy of Virat Kohli in the dramatic Test series that ended earlier this year. 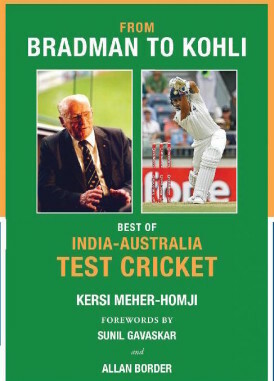 And here we have this book by the inimitable Kersi Meher-Homji (born 1938) who is Mr. India/Australia Cricket himself having emigrated from Bombay to Sydney, Australia in 1970 and watched every Test match between the two nations either at the ground or on TV since 1956. Kersi is amazingly prolific even into his 80s and this is his 15th cricket book, the first, Cricket’s Great Families having been published in 1980. India first toured Australia in 1947-48 when the home side were led by the legendary Don Bradman and were dubbed cricket’s ‘Invincibles’ after they thrashed England 4-0 in the five-Test Ashes series in 1948. They won by the same margin against the hapless Indians too in what was Bradman’s final home series. But to the author’s credit he has not forgotten the early pioneers. Even before the first official series in 1947-48 and the first official Australian team to tour India in 1956-57, two Australian sides visited India for what were then known as unofficial Test matches, first in 1935-36 (known as the Maharaja of Patiala’s Australian team led by Jack Ryder) and then the 1945 Australian Services side shortly after the end of World War II, led by Lindsay Hassett. The second official tour in 1967-68 saw India suffer a whitewash, losing all four Tests despite heroic batting by skipper ‘Tiger’ Pataudi. Since 1996-97 the two nations—who share January 26 as Republic Day/Australia Day—have fought for the Border-Gavaskar Trophy, named after two stalwarts, Allan Border and Sunil Gavaskar and Kersi has certainly pulled off a coup by getting both of them to write forewords for his book. It was the 2000-01 series in India that captured the attention of the cricket world and helped place Test matches between these two nations on the high pedestal it now finds itself. Since India and Pakistan no longer meet in the Test arena, it would be no exaggeration to state this series now matches the ancient ‘Ashes’ rivalry between England and Australia. India were trounced by 10 wickets in the opening Test at Mumbai but turned around the second at Kolkata, winning by 171 runs after being asked to follow-on, only the third time this had been achieved in Test cricket history. The hosts then scraped home by two wickets in the third and final Test at Chennai to clinch the rubber 2-1 in what is considered one of the greatest Test series of all time. Chennai (then Madras) was also the venue for only the second tied Test match in cricket history back in 1986. Kersi captures all the drama in his racy style, each series in Australia and in India being described briefly and with plenty of interesting sidelights, not forgetting the controversies. The book is rounded off with statistics, quirky trivia and a best Australia XI v India and India XI v Australia. A real treat for cricket fans. Pity though that the publishers did not include any colour photos. This week we welcome back Rodney Ulyate, although unfortunately it would seem he was less than impressed with this unusual book of cricket fiction.